The Crossing in downtown Jamaica will include 669 apartments and retail space. QUEENS — A Manhattan-based developer has received a $323 million loan from the city for the construction of The Crossing, a massive two-tower mixed-use complex planned for the Jamaica AirTrain station area, city officials said. The loan that BRP Companies obtained from the New York City Housing Development Corporation to construct the FXFOWLE-designed buildings was first reported by the Real Deal. 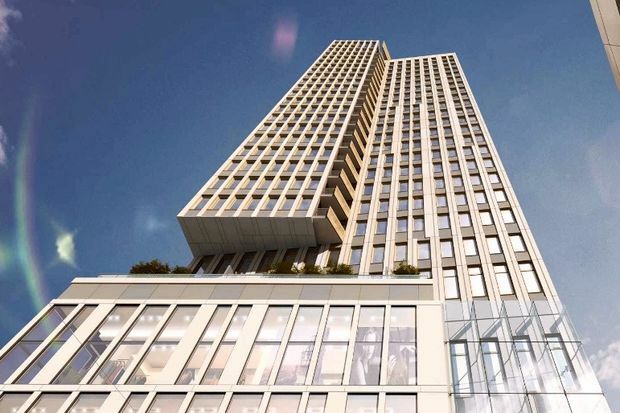 It will provide $259 million for a 26-story high-rise at 147-40 Archer Ave., which will have 539 mixed-income apartments, and $64 million for a 14-story mid-rise with 130 low-income units at 148-10 Archer Ave., representatives for the developer and HDC said. In addition to the 669 residential units, the space will also include 35,000 square-foot of retail space, a community facility, 187 parking spaces as well as roof terraces and a 24-hour doorman. The 730,000 square-foot complex, which will be built on the north side of the Long Island Rail Road and AirTrain stations, has been called one of the largest developments in downtown Jamaica in decades. The complex is one of several affordable housing developments planned for downtown Jamaica, including a recently announced complex featuring 350 apartments on 168th Street between Jamaica and Archer avenues which will replace a dilapidated NYPD parking garage.